A view from North Waihi looking south down main street. Waihi is a town in Hauraki District in the North Island of New Zealand, especially notable for its history as a gold mine town. It had a population of 4,527 at the 2013 census. The town is at the foot of the microclimate for New Zealand's east coast with an average annual rainfall of 2147 mm. 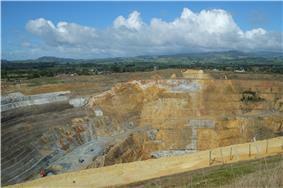 Waihi is located in the Coromandel district, which was one of the great gold mining districts of the world. The township grew around the mining operations since the discovery of gold in 1878 by prospectors John McCombie and Robert Lee. The samples of rock they had sent to be assayed were not considered worthwhile, so they left the area. Their claim was taken over by William Nicholl in 1879. He marked out 5 acres (20,000 m2), calling his claim 'Martha' after a family member. Several smaller claims were later merged to form the Martha Company. By 1882 the first battery to break gold-bearing rock was in operation. The Martha Mine eventually grew into one of the world's most important gold and silver mines, after industrial cyanide processes made recovering gold from the low-grade ores easier. Waihi prospered with the mine, by 1908 being the fastest-growing town in the Auckland Province, three times the size of Hamilton. 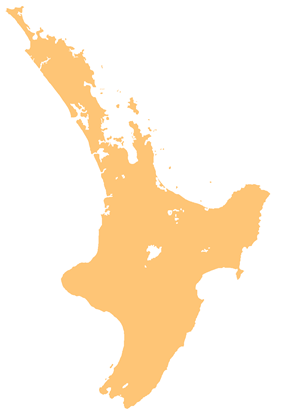 Waihi was also a major centre of union unrest in New Zealand during the early years of the 20th century. The 1912 miners' strike led to violence, including the death of unionist Fred Evans in an incident which still causes some resentment in the town. By 1952, when the mighty Martha Mine closed, around 5.6 million ounces (174,160 kg) of gold and 38.4 million ounces (1,193,180 kg) of silver had been produced from 11,932,000 tonnes of ore. Mining stopped in 1952 after a total of 160 km of tunnels had been driven into the quartz of Martha Hill, not because the Martha had run out of gold, but rather because of fixed gold prices, lack of manpower, and increasing costs. Mining in the Coromandel Peninsula had otherwise ceased by the 1980s. However, mining later resumed, with some protests against it during the 1987 consent process. Plans to stop operations in the 2000s were eventually shelved as well, and the Newmont Mining corporation is currently (2009) actively investing in extending the further economic life of the mine and the underground operations in nearby Favona. As of 2009, the mine comprises about 25-30% of the local economy. In November 1905, a branch line railway was opened to Waihi from Paeroa; this eventually evolved into the East Coast Main Trunk Railway, which reached Taneatua in 1928. 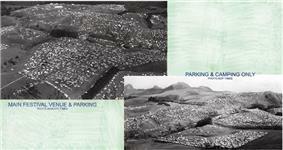 By the 1960s, traffic volumes for the port of Tauranga had outgrown the capacity of the circuitous line through Waihi and a deviation to the south was built. It opened in 1978, making the line through Waihi redundant, but the Goldfields Railway was established to save the six kilometres of railway between Waihi and Waikino. The railway continues to operate today and is a popular tourist attraction. The Nambassa festival in 1979. In the 1970s Waihi saw a large influx of hippies in search of environmentally friendly alternative lifestyles settle there and around the Waikino area. These young counterculture proponents bought with them numerous cottage industries which helped supplement Waihi's economy. The Nambassa rock and alternative festivals were held around Waihi and Waikino between 1975 and 1982, increasing the population by around 10,000-75,000 for a few days each year and bringing revenue to the town. Temporary tent cities were established on the Northern end of Waihi on farms up Landlyst Rd at Golden Valley, to accommodate festival goers. In the late 1980s a new open pit started operations over the top of the old underground mine. This operation is nearing its completion, however recent plans to cutback the pit wall have postponed the promised lake and recreational area. A new underground mine called Favona is in operation near the processing plant to the east of Waihi. The mining company have stated that it is impossible to create the lake while underground operations are occurring near the site because the low-level water table connects with the underground mine which has to be de-watered. In the late 1990s several properties had to be condemned and roads permanently closed after the land under them subsided as a result of the collapse of old underground mine workings, with visible holes and cracks on the surface. In December 2001, a home adjacent to Martha Pit collapsed into historical workings, 14 neighbouring homes were affected, some never able to return to get personal belongings. Another 31 homes were also bought once more areas were identified to be at high, medium or low risk of collapse into historical workings adjacent to the pit. Today the mine's smoko room sits near this site. Noise, dust, blasting vibrations continue to cause stress for some residents as operations in the pit continue. The iconic Pumphouse has been moved to ensure its safety which also allows for the mine pit to be widened and more gold retrieved from the site the pumphouse was housed. Mine management has received positive responses for its rigorous environmental effects control procedures and its commitment to the local community in terms of consultation and financial assistance. This has, amongst other things, led to the mine management company, Newmont-Waihi, receiving the 'Advanced Sustainable Business Award' from Environment Waikato, the Regional Council of the area. Despite all these attempts some of the mine's neighbours do not qualify for compensation for the mine's impact. A replica of the famous Waihi Poppet Head, situated at the Northern End of Waihi Township. Mining remains the major employer in the area thanks to the company postponing the long promised mine closure and lake formation in 2007. Newmont will stay until 2017 when consents expire, unless they find more resources when they will apply to stay. Until the electrical appliance industry was deregulated in New Zealand in the 1980s, Waihi had a television assembly plant operated first by Akrad then by Philips which employed 400 locally and 1500 nationwide. ^ "Subnational Population Estimates: At 30 June 2015 (provisional)". ^ "Conservation land could be mined - Govt".